The chance to experience an opera from the 1920s that hasn’t been seen or heard for nearly 90 years was in theory too good an opportunity to miss. Holofernes by Emil von Reznicek was premiered at the Charlottenburg Opera in Berlin (now the Deutsche Oper) in 1923 and was revived for a further couple of seasons before, like Reznicek’s other dozen or so operas, falling completely from the repertoire. The Viennese-born, Berlin-settled composer (1860-1945) is now known, if at all, for the overture to his 1894 comic opera Donna Diana – that work was only revived on stage in modern times as recently as 2003. Some of that neglect must be down to the retrogressive nature of his musical language, which would have sounded distinctly passé at the time of its writing, if Holofernes is anything to go by. A subject as dramatic, and lurid, as the beheading of Nebuchudnezar’s general Holofernes by the beautiful Judith, written in the wake of Strauss’s Salome and Elektra, would seem a shoe-in for the lush, late-Romantic bordering on Expressionist musical styles that were prevalent at the time. But Reznicek resorts to a kind of third-hand Wagner for his declamatory vocal writing and orchestral textures, with intermittent local colour hinting at the Russian colourists. In short, the music wouldn’t have sounded out of place 30 or more years earlier. Moreover, Reznicek doesn’t seem able to sustain anything for long: the score sounds fragmentary, a sequence of short, unconnected moments, rather than the through-composed music drama it is presumably aiming to be. 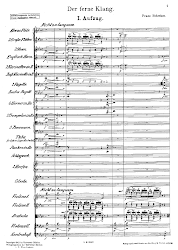 A lot of the musical ideas are trite and short-winded, the melodies – apart from the quoted Kol nidrei – are unmemorable, and only some occasional flashes of orchestral imagination – for instance when trying to sound ‘modern’ in the Straussian sense – hint at what could have been. 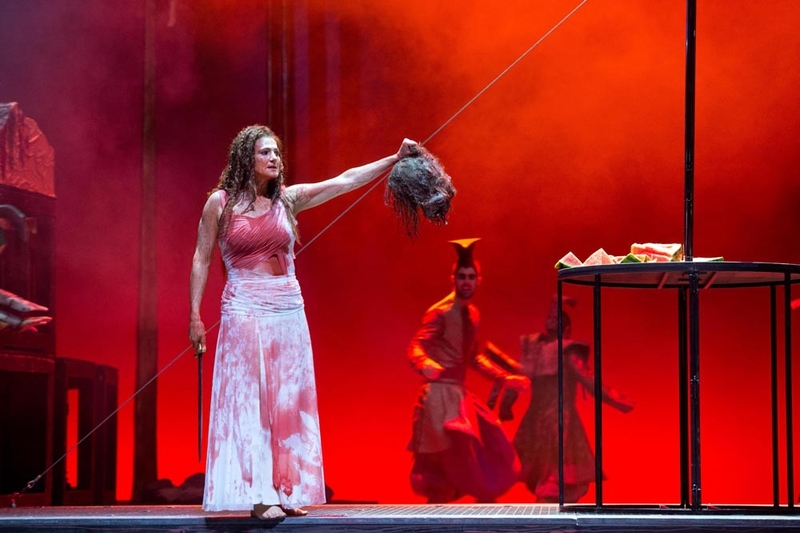 The saving grace of the opera is that it is short – about the length of Salome, including an interval, though it was made a little longer here by the inclusion of an overture added, presumably for its last revival, in 1926. 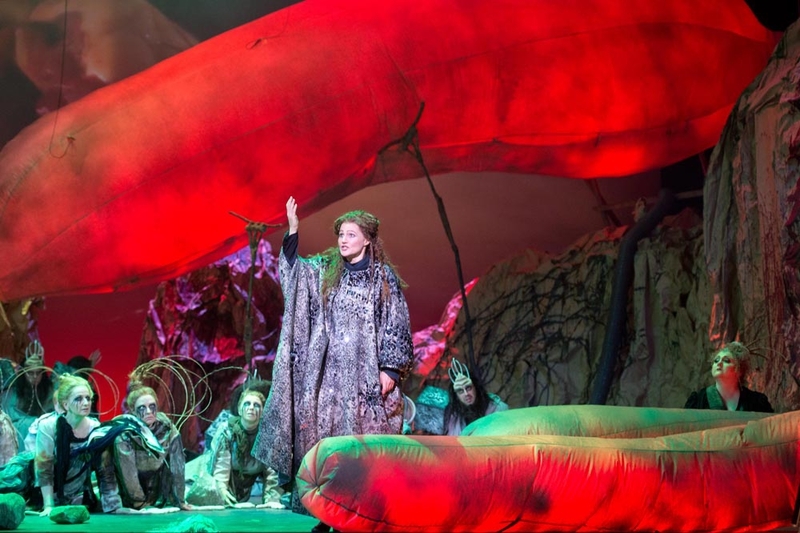 Bonn Opera threw everything at it to try and convince us that it is worthy of being staged. 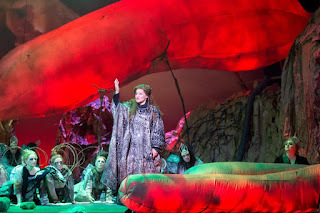 Or at least that is the impression left by a completely over-the-top production by director Jürgen R. Meyer, in which excess seems the order of the day. (Fortunately, the company also threw musical quality its way, of which more later.) Any attempt to exaggerate, to camp it up, is taken. Kristopher Kempf’s costumes are straight out of 1960s Star Trek, as the Israelites and Assyrians are dressed to kill like the exotic humanoid aliens encountered by the Enterprise crew. Quite why the Jewish priests had huge boxes on their shoulders (misplaced tefillin?) or why the Assyrian soldiers were dressed up as spiders or horses was not made clear. And what was with the giant inflatable banana looming over the Jewish village (Abra, Judith’s maid, at one point tries to get her mistress to eat a real one, too)? Perhaps related to the phallic graffiti decorating Holofernes’s siege tower that dominates Act II. There is more fruit later, when Judith tries out her machete skills on a water melon before moving on to the sleeping Holofernes himself. Throughout, there is a surfeit of imagery conveying torture – bodies on poles, severed heads used as counterweights to drawbridges, and in Act I some rather unsavoury video imagery of someone severing the head of a plastic doll with a knife and hatchet. The director attempts to inject some humour into proceedings in his direction of character – especially with the tiresomely over-demonstrative Abra – but it only points up how laughable the whole production is, for instance with the poor onstage orchestral trumpeter forced unconvincingly to ‘act’ out a tiff with the slave holding his music (the second time he appears, he gets stabbed for his labours). And is that Chinese calligraphy projected on to one of the suspended, vegetable-like balloons in the closing scene? It all makes Judith’s suicide at the end seem a saving grace rather than a tragic denouement. 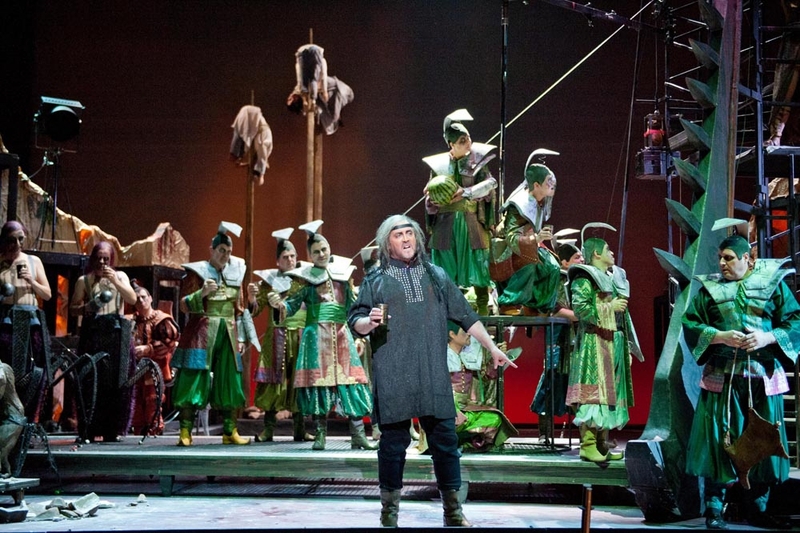 The cast, chorus and orchestra did as much as they could with the material. Mark Morouse’s Holofernes saved the character from becoming too much of a pantomime villain (the vocal writing suggests Alberich at times), while Johanni van Oostrum’s Judith was suitably alluring of voice and stage presence. The subsidiary roles were also creditably performed. And conductor Jacques Lacombe deserves credit for keeping the performance moving, not easy given the often perfunctory nature of Reznieck’s writing. I went with an open mind and wish I had enjoyed it more, but it does go to show that, try as we might to persuade ourselves otherwise, some works are forgotten for a reason. Thank you for the review. Seeing the production I had the same questions as you. Small note: The singer on your first photo is Johanni van Oostrum and not Celine Byrne. Thanks, Naomi - not sure where that name came from!